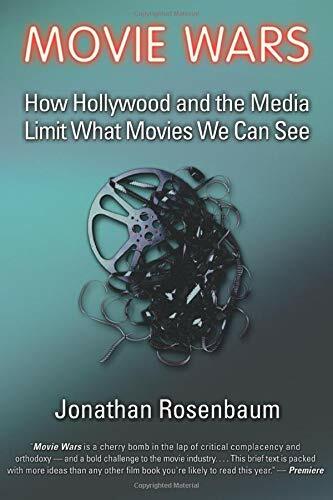 Jonathan Rosenbaum's "Movie Wars: How Hollywood and the Media Conspire to Limit What Films We Can See" (A Cappella Books, $24, Hardcover) is bound to reach only a small audience of devoted cultists, but it's an eye-opener nonetheless. In a series of essays, on topics ranging from the American Film Institute's Top 100 list to the reception of Joe Dante's Small Soldiers, Rosenbaum -- one of America's great film critics -- dissects the film business and the values of the American public with an acute eye. He deconstructs the giant distribution company Miramax and explores the recent resurgence of interest in Orson Welles. The conclusion -- that audiences, critics and distributors alike don't have as much choice in what they see as they think they do -- is a bitter pill to swallow. But one feels better waking up to the truth rather than keeping the blinders on.